Earlier this month, I saw on the news that at one point there was snow on the ground in every single state in the United States for the first time. I know that we’ve been slammed this year with snow and that my friends to the north got snow this weekend, too. My girls had so much fun making colored snow when the snow was fresh. They tried to “sell” me a snowcone! 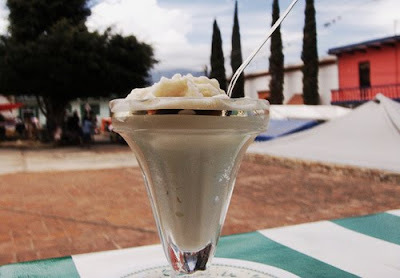 In Mexico, you can enjoy a refreshing and light frozen treat called nieve. Nieve literally means snow. Luckily no snow on the ground is required for this one! 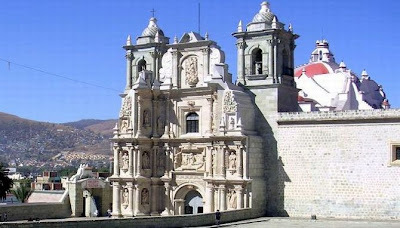 There is an old legend that Emperor Moctezuma enjoyed nieve so much, that he had his fastest runners bring him the treat from the snow capped mountains that surrounded Tenochtitlan. Nieve is a frozen treat made with purified or distilled water and tropical fruits or other flavored ingredients. Today, you can find nieves in markets, small vendors, and specialty stores. 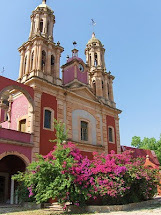 In Oaxaca, the best place for nieves is in the courtyard of La Soledad church. 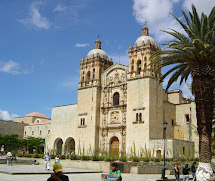 The Virgin of La Soledad is the patron saint of Oaxaca and this beautiful cathedral offers a lovely shaded courtyard to visitors who wish to take a break from the sun while they enjoy their nieve. It can be served in a cone or dish and is available in a myriad of unique flavors. The nieves flavors range from the traditional vanilla, chocolate, and strawberry, to other more exotic varieties. Tropical fruits such as mangoes, coconuts, and pineapple are popular. How about trying tequila or it’s relative, mezcal? De Rosas is a unique flavor that is actually made with rose petals. Cajeta is a delicious caramel flavor made with rich condensed milk. My two favorite flavors are tuna and mamey. Tuna is a variety of prickly pear, which is actually a cactus. Mamey is a fruit that has a dense texture and tastes like a combination of sweet potato, pumpkin, and vanilla in one bite. It’s so delicious, but the flavor is difficult to describe. 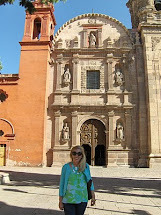 Another treat to savor in Oaxaca is a paleta from Popeye! 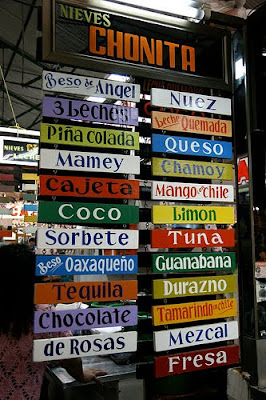 Paletas are popsicles and are also available in the same wide variety as nieve. You can have a water or milk based popsicle in many flavors. 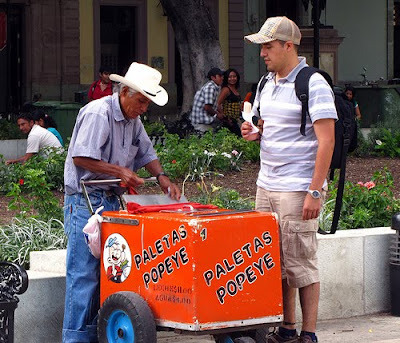 There are roaming Popeye vendors in the Zocalo, main square, or throughout town. I personally like the Popeye store close to the English Language Library in the Conzatti garden the best because selection of flavors can be found there. Dream of sunshine and warm days! definitely sounds better than what is currently falling from the sky outside my window at the moment! Mmmmmm! Summer and frozen, flavored treats! Sigh! Thanks for this, I needed it!! Looks like a pina colada!!! Are you guys in the snow path for this round of storms? We've been told snow Wed/Thurs is likely. Booo...I'm just now able to see the grass in my back yard!